I recently came across the following article by David Binder, longtime regional correspondent for the New York Times, about the National Art Museum in Bucharest. The article appeared in the NYT on 19 January 1990. 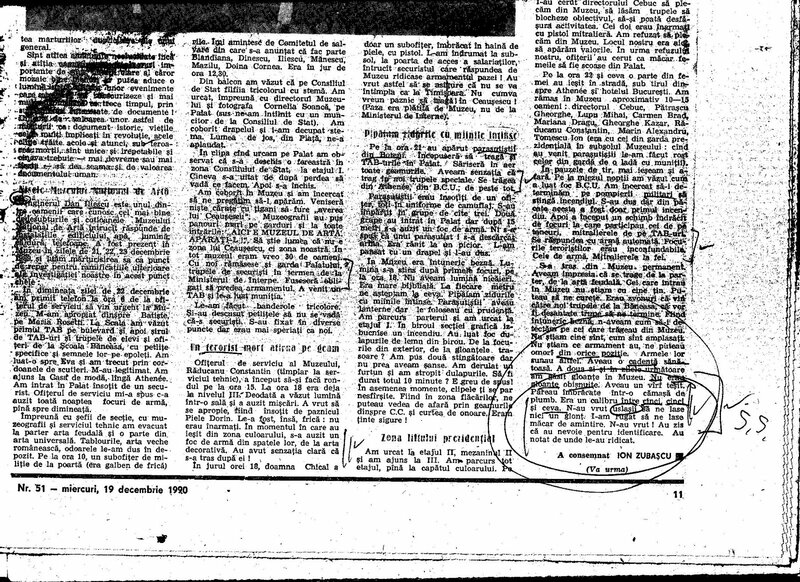 Below, Romanian articles discussing the battles as witnessed from inside the Art Museum. BUCHAREST, Rumania, Jan. 18— Rumania’s National Museum of Art, severely damaged in last month’s popular uprising, was visited today by two senior officials of the Metropolitan Museum of Art who said they wanted to see whether American art institutions could help in the restoration. ”We are here in collegial solidarity,” said Philippe de Montebello, the director of the Metropolitan, who arrived here on Wednesday afternoon with Everett Fahy, the Metropolitan’s curator of European paintings. They were guided through the storerooms Wednesday and today by Theodor Enescu, the new director of the Rumanian museum, and members of the staff who showed the visitors Rumanian and Italian works that had been holed by bullets and melted by fire. ”We came to see the extent of the damage and to explore ways we could be helpful,” Mr. de Montebello said halfway through the tour. He said he would report to a meeting of American art museum directors later this month on the Rumanian museum’s need for restoration laboratory equipment, microscopes and rice paper to cover the damaged works. ”It is not impossible that a few selected paintings, possibly with one of the Rumanian restorers, will be brought to the Metropolitan for work,” he said. That was the morning of Dec. 22. The day before, President Nicolae Ceaucescu had spoken from across Palace Square at his central committee building and, after being interrupted by booing and shouting, had primised ”bunuri” – ”the goods” -to his repressed people. Now the large square was full of restive Rumanians again. ”What we were afraid of was thieves,” said Codruta Cruceanu, a member of the museum’s staff of 60. She and the others, aided by art students, Bucharest painters and ordinary citizen volunteers, began moving thousands of paintings and other artworks to a second-floor storage room. They left a Rembrandt, a Jan Bruegel, some Memlings and a large El Greco on the walls. ”We never expected shooting,” Miss Cruceanu said. But that afternoon, a few hours after Mr. Ceaucescu and his wife had fled the capital by helicopter, hundreds of members of his elite bodyguard, the so-called Special Troop, entered the museum and turned it into a fortress. The bodyguards were armed with bazookas, machine guns and sniper rifles and they began firing at people in the square and at units of the Rumanian army that had joined the popular uprising. Another unit of the Special Troop did the same thing in the venerable library of the University of Bucharest across the square. Miss Cruceanu said the bodyguards, who were part of the Ceaucescu state security forces called Securitate, had entered the museum mostly by the skylights from the old royal palace, which is part of the same buildling complex as the art museum. One floor of the museum is in fact directly above the former palace throne room, which Mr. Ceausescu had used for state ceremonies. Within a short time, army forces were firing back at the museum and at the university library. The shooting resumed Dec. 23 and continued night and day until Dec. 25. All of the museum’s windows were shot out and there are holes in the walls big enough to drive a car through. Fires broke out on all three floors of the museum, and at the library, the Securitate troops set fire to the building before retreating into deep underground tunnels that lace the capital. In the museum the fires destroyed the entire archives of the graphic arts department and the decorative arts department. ”Decades of work were burned up,” said Miss Cruceanu, including embroidery studies by Anka Lazarescu, icon studies by Anna Dobjanschi and momument studies by Liana Tugearu. The museum’s restoration laboratory was also burned out. Of the various collections, 75 Rumanian paintings from the 19th and 20th centuries were damaged, although most of the works of Nicolae Grigorescu, an Impressionist who is regarded as Rumania’s greatest painter, were preserved because they had been taken down earlier so that the exhibition room could be repainted. Miss Cruceanu said that 45 other paintings and 10 sculptures had been seriously damaged and that at least 10 paintings had been burned ”beyond recognition.” Among the damaged works are a 17th-century painting of Hercules by Luca Giordano, ”Mother With Child” by Allesandro Allori, ”Samson Destroying the Temple” by Giulio Procaccini, and a 16th-century Italian Annunciation scene. Four Rumanian icons were hit by bullets. Of four large tapestries on the third floor, one was almost completely burned. Mr. de Montebello and Mr. Fahy were originally scheduled to be received by Alexandru Cebuc, whom Mr. Ceaucescu had appointed director of the museum. But earlier this week Mr. Cebuc, whom Miss Cruceanu described as a dictator himself, was ousted by the Minister of Culture, Andrei Plesu, and replaced by Mr. Enescu. Compared to the university library, where irreplaceable manuscripts were incinerated by the Securitate forces, the museum collections, having been largely brought to safety, were for the most part preserved. One of the very few visual displays in the museum is a huge color poster showing Nicolae and Elena Ceaucescu standing with some Rumanian children in national costume. Workers painted a caption, ”The Most Beloved Masters,” above it and then put yellow and red devils’ ears and swastikas on the faces of the pair. Miss Cruceanu said that the museum had been forced to display a large portrait of the Ceaucescus in a field of wheat during the dictatorship, but that, mercifully, it was gone now. 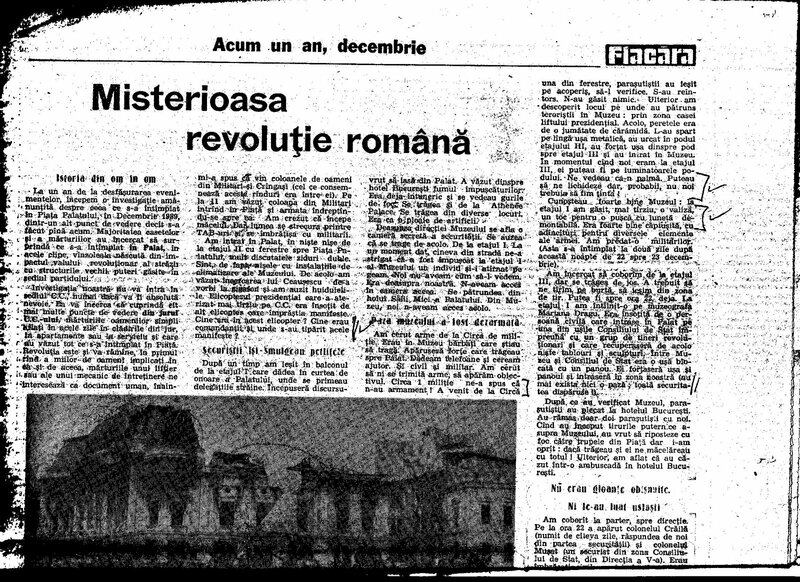 Ion Zubascu, “Misterioasa revolutie romana,” Flacara, 19 decembrie 1990, p. 11.